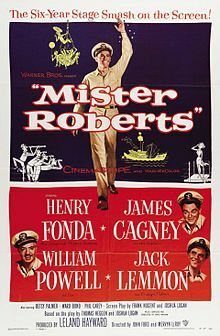 Mister Roberts is a 1955 American Warnercolor in CinemaScope comedy-drama film directed by John Ford and Mervyn LeRoy and features an all-star cast including Henry Fonda as Mister Roberts, James Cagney as Captain Morton, William Powell (in his final film appearance) as Doc, and Jack Lemmon as Ensign Pulver. Based on the 1946 novel and 1948 Broadway play, the film was nominated for the three Academy Awards, including Best Picture and Best Sound, Recording (William A. Mueller), with Jack Lemmon winning the award for Best Supporting Actor. In the waning days of World War II, the United States Navy cargo ship Reluctant (also called “The Bucket”) and her crew are stationed in the "backwater" areas of the Pacific Ocean. The executive officer/cargo chief, Lieutenant (junior grade) Douglas A. "Doug" Roberts (Henry Fonda), tries to shield the dispirited crew from the harsh and unpopular captain, Lieutenant Commander Morton (James Cagney). Eager to join the fighting, Roberts repeatedly requests a transfer. Morton is forced by regulation to forward his requests, but refuses to endorse them, which means that they are always rejected. Roberts shares quarters with Ensign Frank Thurlowe Pulver (Jack Lemmon). Pulver spends most of his time idling in his bunk and avoids the captain at all costs, so much so, that Morton is initially unaware that Pulver is part of the crew. Once discovered, Pulver cowers before Morton despite bold ideas for revenge expressed to the crew. Roberts surreptitiously requests and is granted crew liberty from one of Morton’s superiors; a port captain who wishes to reward the Reluctant's crew for meeting a difficult resupply schedule. The liberty is supposed to be at their next resupply stop, but when the ship reaches an idyllic South Pacific island, Morton denies the crew their much-needed shore leave. In private, Morton tells Roberts that the crew will not get liberty as long as he continues to request a transfer and writes letters regarding disharmony aboard the ship, which endanger Morton's chances of promotion. Morton strikes a bargain with Roberts: In exchange for never requesting another transfer, never bending Morton's rules, and never revealing what has made him change his attitude, Morton will grant the crew liberty. Meanwhile, the crewmen are mystified by Roberts’ new strictness. Morton deceives them into thinking that Roberts is trying to get a promotion. When a crew member informs Roberts of a new Navy policy which might assist him in getting a transfer despite the captain's opposition, Roberts refuses to take advantage of it. News of the Allied victory in Europe depresses Roberts further, knowing the war may end soon without his ever seeing combat. Inspired by a patriotic radio speech celebrating VE Day, Roberts throws Morton's prized palm tree overboard. The captain demands the identity of the culprit, but no one steps forward. He eventually realizes that Roberts is the only person aboard with the nerve to do it. Morton summons him to his quarters and accuses him of the deed. An open microphone reveals to the crew what changed Roberts. Weeks later, Roberts receives an unexpected transfer. "Doc" (William Powell), the ship's doctor and Roberts' friend, confides to him that the crew risked court-martial by submitting a transfer request with Morton's forged imprimatur. Before he leaves, the crew presents Roberts with a handmade medal, the Order of the Palm, for "action against the enemy". Several weeks later, Pulver, who has been appointed cargo officer, receives a couple of letters. The first is from Roberts, who speaks enthusiastically about his new assignment aboard the destroyer USS Livingston during the Battle of Okinawa. He goes on to say that he would rather have the Order of the Palm than the Medal of Honor. The second letter is from a college classmate of Pulver's who is also assigned to the Livingston, which reveals that Roberts was killed in a kamikaze attack shortly after the first letter had been posted. Incensed, Pulver throws the captain’s replacement palm tree overboard. He then marches into Morton's cabin, openly bragging about it and brazenly demanding to know why Morton has cancelled the showing of a film that night. Morton slowly shakes his head, realizing that his problems have not gone away. Fonda was not the original choice to star in the film version; Warner Bros. was considering William Holden or Marlon Brando for the lead role. The studio thought Fonda had been on stage and off the screen so long (8 years) that he was no longer a movie box office draw. In addition, when filming began he was 49, much older than the average lieutenant junior grade. Fonda was only hired because director John Ford insisted. Also featured were James Cagney as Captain Morton, William Powell, in his last feature film, as "Doc", Jack Lemmon as Ensign Pulver (a role for which he won the Academy Award for Best Supporting Actor), Betsy Palmer, Ward Bond, Philip Carey, Nick Adams, Ken Curtis, Harry Carey, Jr. and Martin Milner. The screenplay was written by Joshua Logan and Frank S. Nugent. The movie was directed by John Ford, Mervyn LeRoy and Joshua Logan who was uncredited. While directing the film, Ford had personality conflicts with actors Henry Fonda and James Cagney. When Ford met Cagney at the airport, the director warned that they would "tangle asses," which caught Cagney by surprise. Cagney later said: "I would have kicked his brains out. He was so goddamned mean to everybody. He was truly a nasty old man." The next day, Cagney was slightly late on set, and Ford became incensed. Cagney cut short the imminent tirade, saying: "When I started this picture, you said that we would tangle asses before this was over. I'm ready now – are you?" Ford backed down and walked away and he and Cagney had no further conflicts on the set. Nevertheless, Ford was replaced by LeRoy after difficulties with Fonda (Ford apparently punched Fonda in the jaw during a heated argument), and a gall bladder attack that necessitated emergency surgery. It has been widely speculated which scenes were directed by LeRoy. Jack Lemmon shed some light on this issue in his DVD commentary: "Mervyn LeRoy would watch all of the rushes that Ford had shot prior to his temporary departure and decided to shoot them the way John Ford would have shot 'em." Logan, who had directed the original stage production in which Fonda starred, re-shot major portions of the film, at Fonda's request. The DVD release of this film includes an audio commentary by Lemmon in which he recounts stories of his experience making the film and his views on acting. During the production of the film, Lemmon began a long-term friendship with Cagney which continued until Cagney's death in 1986. Prior to his appearance in his first film, years before Mister Roberts, he started in live television. In one particular performance, Lemmon decided to play his character differently. He decided to play the character left-handed, which was opposite to his own way of movement. With much practice, he pulled off the performance without anyone noticing the change. This change even fooled Lemmon's wife at the time. A few years went by and Lemmon met Cagney on their way to Midway Island to film Mister Roberts. They introduced themselves, and Cagney chimed in, "Are you still fooling people into believing you're left handed?" They had a great laugh and a strong friendship was born. Henry Fonda wrote in his 1982 autobiography, My Life, that he believed that as good as the movie is, the play is even better. The film was William Powell's last movie, although he died years later in 1984. It was also James Cagney's last movie for Warner Brothers, the studio that had propelled him to stardom 25 years before and the studio to which he had spent the majority of his career under contract. In late August 1954 Hewell departed Hawaii for Midway Island, mooring at the Naval Base there on 28 August to help film the Warner Brothers movie Mister Roberts. The film, starring Henry Fonda, James Cagney, William Powell and Jack Lemmon, was partially shot on board Hewell, with underway footage filmed off Midway Harbor between 1 and 16 September. The light cargo ship then sailed back to Hawaii between 24 and 29 September and additional film was shot off Kaneohe Bay between 30 September and 7 October. A 1994 article which appeared in the newsletter of the Keyport, Washington Naval Undersea Warfare Center, contending that IX-308 (another Army FS vessel converted to a Navy AKL and assigned torpedo recovery duties at Keyport) was used in filming of Mister Roberts and not Hewell, created a controversy . That ship had been named USNS New Bedford for its service out of that port serving the USAF Texas Towers. All but one of the Navy's AKLs were built as U.S. Army FP/FS type cargo vessels transferred to the Navy. As it was, an AKL carried a much smaller crew than the USS Virgo (AKA-20) and USS Rotanin (AK-108), both of which Thomas Heggen served on during the war. In the movie, Mr. Roberts says to Doc that there are "62 men" aboard which would have been far too many for an AKL. A number of modifications to the AKL exterior appearance were made for the film. The "palm tree" was located on a "deck" built for the movie by extending the small deckhouse of the AKL and building movie set ladders to the bridge and main deck. The crew, when going below to their berthing compartment, are shown in the movie to be descending into the cargo hold. The film was a financial success. It grossed $21,200,000, earning $8.5 million in US theatrical rentals. Mister Roberts was followed by a film sequel, Ensign Pulver (1964), with Robert Walker, Jr. starring as Pulver. It also starred Burl Ives as Captain Morton, Walter Matthau as Doc, and in small roles, Larry Hagman and Jack Nicholson, among others. Much of the screenplay was derived from Heggen's original book. The original film was the basis of the 1965 TV series Mister Roberts, which lasted one season, and the film was remade for television in 1984 as a live telecast shot mostly in the form of a stage play. ^ a b Box Office Information for Mister Roberts. The Numbers. Retrieved August 27, 2013. ^ "Behind the Scenes of Mister Roberts 1955"
^ Warren, Doug; Cagney, James (1986) . Cagney: The Authorized Biography (Mass Market ed.). New York: St. Martin's Press. ISBN 0-312-90207-7. ^ Another of the FP/FS conversions was USS Pueblo. ^ Levy, Bill (1998). John Ford: A Bio-Bibliography. Westport, CT: Greenwood Press. p. 176. ISBN 0-313-27514-9. ^ Navy History & Heritage Command-Ships History Branch. "Hewell". Dictionary of American Naval Fighting Ships (DANFS). Retrieved September 23, 2011. ^ Sea Bird Adventure. "USNS New Bedford the Mister Roberts Ship". Sea Bird Adventure. Retrieved September 23, 2011. ^ Jackson, Ramon. "Not the USS Hewell (AKL 14) in the movie? Think again". Army FP/FS Vessels. Archived from the original on February 12, 2012. Retrieved September 23, 2011. ^ a b Priolo, Gary P. "Light Cargo Ship (AKL-17)". NavSource Naval History. Retrieved September 23, 2011. ^ National Air Defense Radar Museum. "The Texas Towers". Archived from the original on April 2, 2012. Retrieved September 23, 2011. ^ Jackson, Ramon (November 27, 2007). "Army FP/FS Vessels". Ships and Places. Archived from the original on December 4, 2004. Retrieved June 14, 2008. ^ Heckman, Hugh M. (January 1979). "The Story and Memories of the USS VIRGO AKA-20 / AE-30, USS Virgo and Mr. Roberts". Sea Classics. Challenge Publications, Inc. Archived from the original on August 21, 2008. Retrieved January 16, 2010. ^ Friberg, Capt. Carl. "A Movie Seastory That Bugged Me (Detailed look at how an AKL was temporarily modified and turned into a movie set)". Views From the Upper Deck. Retrieved January 16, 2010. Wikimedia Commons has media related to Mister Roberts (1955 film). Gary P. Priolo (January 24, 2008). "Light Cargo Ship (AKL): AG-145 / AKL-14 Hewell". NavSource Naval History. Retrieved June 15, 2008. Capt. Carl Friberg. "A Movie Seastory That Bugged Me (Detailed look at how an AKL was temporarily modified and turned into a movie set)". Views From the Upper Deck. Retrieved January 16, 2010.